Set in the beautiful countryside of Dumfriesshire, just 2 miles away from Dumfries. There is a leisure complex close by ( DG1 ) which offers swimming, sauna and gym facilities. 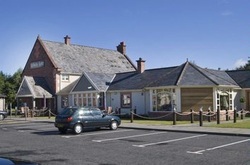 Dumfries Premier Inn has a Table Table restaurant and offers free on-site parking. Book direct for the best Premier Inn Dumfries deals.